President Vladimir Putin said on Thursday that Russia is ready to send peacekeepers to the Golan Heights to replace Austrian forces. “We could replace the leaving Austrian contingent in this region on the border between Israeli troops and the Syrian army,” President Putin said. “But this will happen of course only if the regional powers show interest, and if the UN secretary general asks us to do so,” he added. The UN secretary general recently visited Russia and asked Moscow to increase its presence in the UN peacekeeping forces. Austria said it will withdraw its peacekeepers from the UN monitoring force in the Golan Heights following the battles at Quneitra in Syria early Thursday. Israel demanded the UN to replace the Austrian soldiers as soon as possible. The Philippines also said it is reviewing a troop withdrawal after a Filipino soldier was wounded. 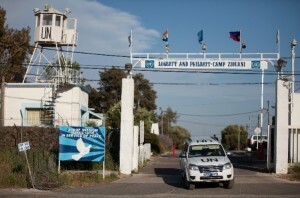 Austria, Philippines, India, Morocco and Moldova have been part of the UN Disengagement Observer Force (UNDOF) in the Golan Heights since its inception in 1974.